Lenoir County, North Carolina, is centrally located in eastern NC. 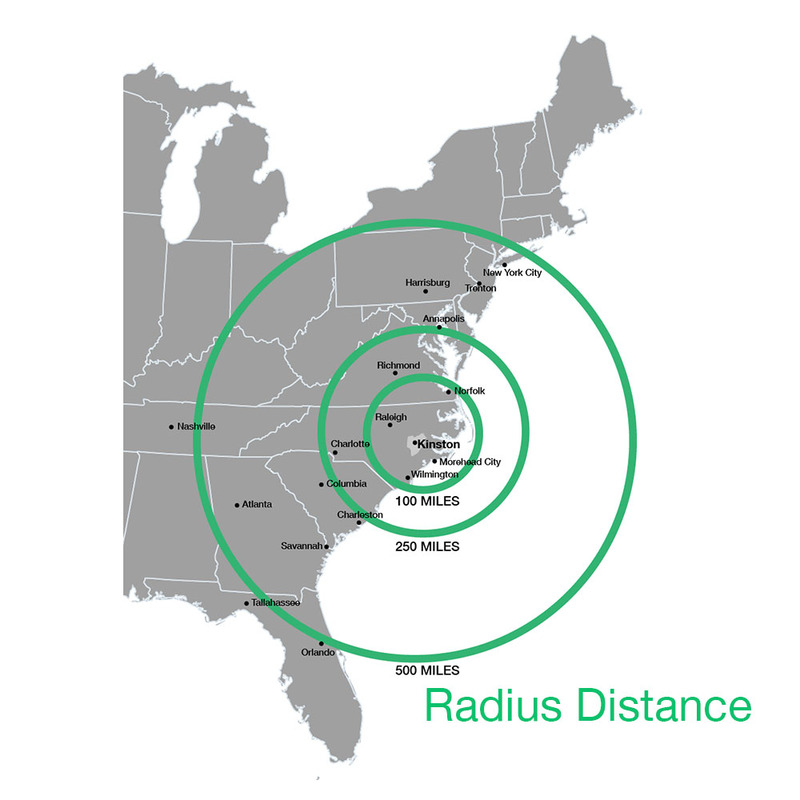 We are approximately 75 miles east of Raleigh (our state’s capital) and 75 miles west of Morehead City (one of our seaports and the beautiful crystal coast). Our county is a blend of agriculture and manufacturing. 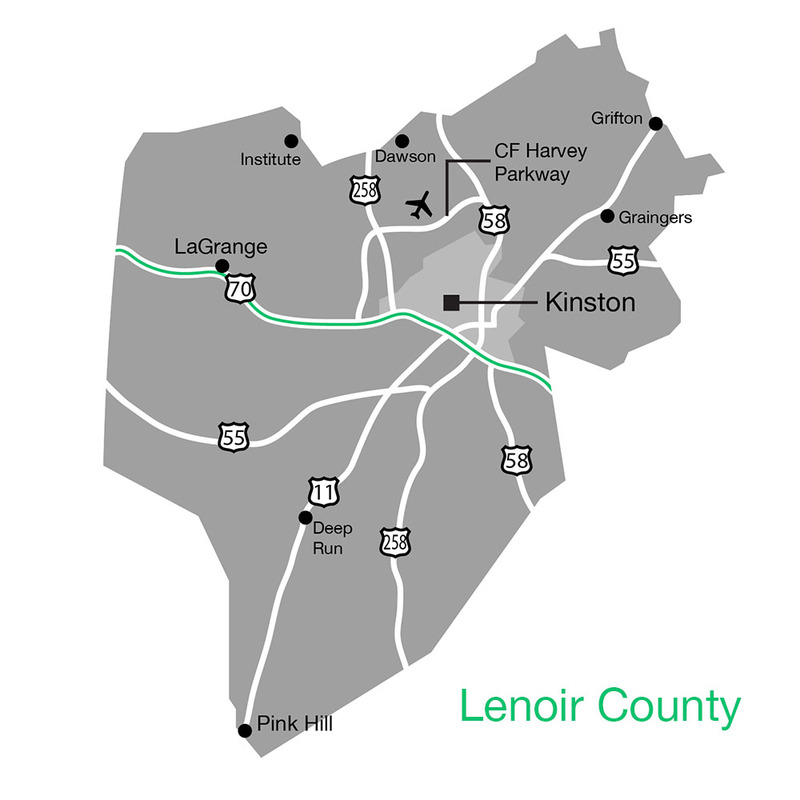 Lenoir County has three incorporated municipalities: Kinston is the county seat, LaGrange, lies approximately 10 miles west of Kinston, and Pink Hill approximately 15 miles south of Kinston.Whether you are a long time resident, newcomer or thinking of relocating to Lenoir County we hope you will find everything you are looking for on this website. We take pride in making Lenoir County a great place to live, work, and play! Lenoir County / Kinston is centrally located on the East Coast of the United States with easy access to major markets. The mild climate and proximity to beaches, mountains, metropolitan areas, universities and other amenities, make Lenoir County an ideal place to live and work. Two deepwater ports that are in close proximity – Wilmington, NC Morehead City, NC in which lay intra coastal waterways and inlets. A four-directional network of rail lines operated by Norfolk Southern, CSX and smaller regional operators serve the GTP region. Because of the area’s central location along the United States’ eastern seaboard, one-day trucking service is available to such major metropolitan markets as Atlanta, Baltimore, New York, Philadelphia and Jacksonville, Florida. Two-day motor freight service reaches deep into the Northeast, Midwest and Southeast, connecting the GTP Region with target cities like Boston, Miami, Chicago, and Pittsburgh. With the massive daily influx of supplies and products destined for the Region’s four major military bases, area companies have an opportunity to negotiate low “back haul” rates on their outbound freight. US 70 (4-lane divided highway) extends east/west from Morehead City to and beyond Raleigh. I-95 I-40 are only 45 minutes from Kinston. The Kinston Regional Jetport (ISO) is located at the Global TransPark with private and charter service. Airport facilities includes an 11,500 foot runway, FAA Control Tower and I ILS being upgraded to CAT III. 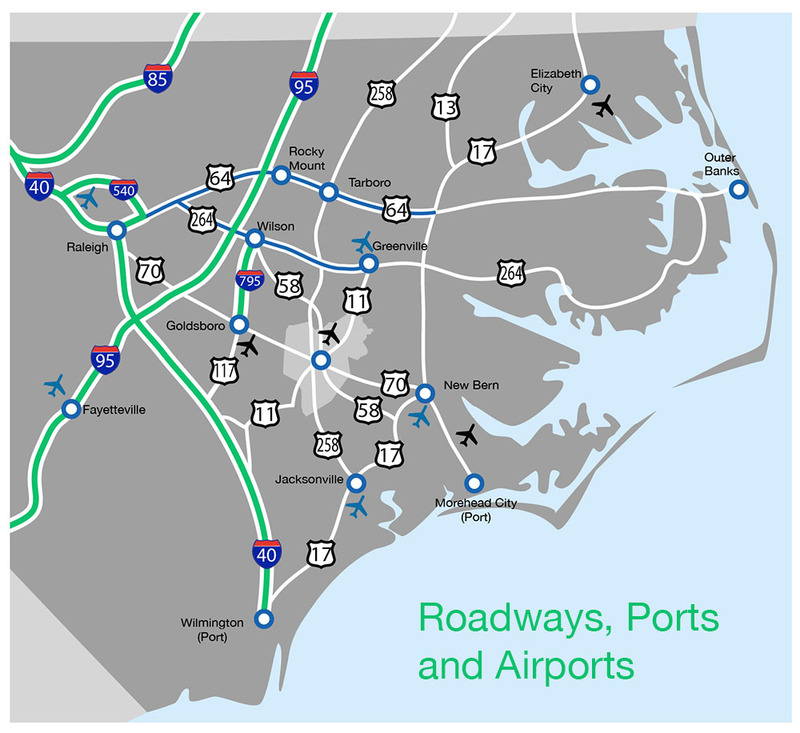 The Raleigh-Durham International Airport (RDU) is only 90 minutes west of Kinston. Foreign Trade Zone – Lenoir County is the home of the NC Global TransPark, a new state of the art air cargo facility. Companies in the NC GTP Region gain a significant competitive advantage from the Global TransPark’s designation as a Foreign Trade Zone and its ability to establish sub-zones. The GTP is Zone No. 214. North Carolina Global TransPark, which is located in Lenoir County. The 2,500 acre multi-modal transportation and industrial complex is designed to meet the present and emerging needs of domestic and global commerce. The park offers unparalleled access to air, rail, highways, and North Carolina’s two international ports. The GTP boasts a pro-business climate aimed at growing the aerospace, logistics, manufacturing, emergency services, defense contracting and supporting industries. The GTP is master planned to eventually encompass 15,300 acres and provide a full range of business amenities.